Many Sunday sections not only were full of “women’s interest” material but also were often written and/or edited by professional women. In 1892, Foster Coates, the city editor of the New York Journal, wrote in Ladies’ Home Journal: “The young woman with a good constitution, who knows how to write good English and is willing to work hard has as good an opportunity as any man similarly equipped to succeed in journalism.”  At the San Francisco Examiner, for instance, Annie Laurie was portrayed as a model “girl reporter” who covered any kind of news story in a style of “vivid, personal writing that was highly charged with emotion” and marked by “short sentences and paragraphs with hard jolts.”  Some women became popular for daily advice columns in William Randolph Hearst’s national chain of papers – for example, Beatrice Fairfax. [figure 3] A few others were well known as drama critics – such as Amy Leslie of the Chicago Daily News – or press agents – for example, Nellie Revell for Percy Williams’ vaudeville circuit. In all, by 1910, more than 4,000 women held writing and editing jobs, largely at newspapers. “Their work,” historian Alice Fahs argues, “shaped new public spaces for women within the physical pages of the newspaper.”  It’s no wonder that so many newspaperwomen entered the motion picture news field. The professional newspaperwomen I have selected to analyse took up writing about motion pictures from different perspectives. Let me categorize those according to a modified version of what Jan Olsson has called several “stages of media interaction.”  They include (1) the flâneuese whose gaze momentarily fastened on this new form of mass entertainment, (2) the columnist who contributed a frequent, even daily, diet of personality profiles of current movie stars, (3) the editor who filled out a special weekly page by selecting and arranging all kinds of material of supposed interest to moviegoers, and, finally, (4) the writer who took on the task of offering daily “independent” film reviews that might help readers to become better informed and discerning spectators. 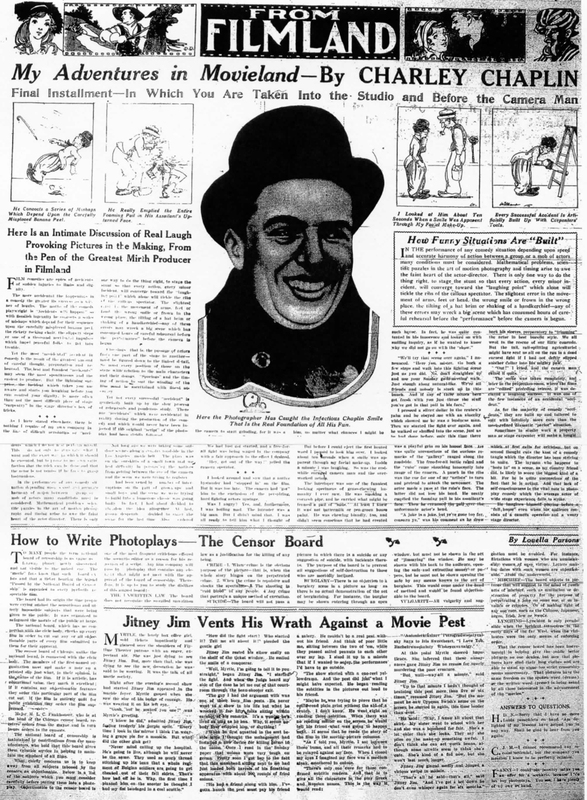 Beginning in November 1912, the Scripps-McRae newspaper chain introduced the first syndicated column of short “personality sketches” that could be picked up by United Press (UP) service clients across the country. [figure 6] The writer was a pioneering journalist located in Chicago, Gertrude Price, “YOUR ‘MOVIE’ EXPERT,” who regaled readers with stories about the “MOVING PICTURE FOLKS.”  Having already written extensively on Price, I’ll simply summarize a couple points here. She wrote in the colloquial language of UP’s distinctive “colorful, readable copy,” with “punchy” headlines, and consistently used the slang term “movies” rather than “photoplays” as a direct appeal to the “bright youngsters [who] gave moving pictures an apt, vivid name.” Almost exclusively focused on American actors, two thirds of them women, her stories were illustrated with halftone images that usually emphasised their faces. Appearing irregularly, but frequently, often at the top of a page (and even on the front page), [figure 7] her stories circulated much like the movies and suggested that stars or “picture personalities” were even more important than company brands or “genres” of films for attracting moviegoers. Because Scripps-McRae newspapers, according to Gerald Baldasty, paid special attention to women readers, especially those of the “lower classes,” Price’s column likely assumed a targeted readership. For more than a year, Price may have been one of the most widely read sources of gossip and information on the movies’ emerging stars. 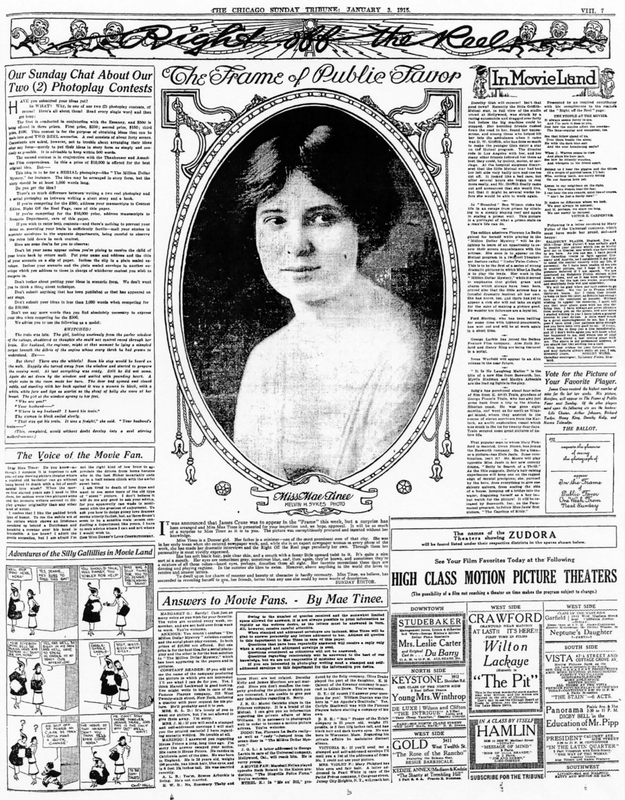 Shortly before Price’s column became occasional in the spring of 1914, the Chicago Sunday Tribune gave a boost to readers’ fascination with stars in the “Right Off the Reel” page, written by Mae Tinee (Frances Peck). [figure 8] Its central feature was “In the Frame of Public Favor,” an unusually large publicity photo and profile of a current picture personality. Much like the huge close up of a movie star on screen, this image could be said to enact what Susan Stewart has called the “gigantic” in the period’s advertising. The first captioned profile of Kathlyn Williams, the star of Selig’s The Adventures of Kathlyn, mixed information and gossip: she was “of the Anglo-Saxon strain – fair-haired and blue eyed” and “courted a dangerous situation for the sheer spice of novelty,” describing that as “all in the day’s work.”  Readers were asked to mail in ballots naming their “favorite player” and each week’s photograph (and brief profile) was of the player who received the most votes. Their choices in the first few weeks suggest what stars were favored by Chicago’s movie fans: Mary Pickford, J. Warren Kerrigan, Alice Joyce, Florence LaBadie, Maurice Costello, and Pearl White. And fans had specific interests: both Costello and Pickford were “married”; “Kerrigan live[d] in Hollywood, Cal., with his mother”; and LaBadie was known for her “pet fad [of] sketching her friends.”  Except for Pickford, all performed chiefly in one- or two-reel films – that is, as frequently recurring figures in the variety package programs of General Film, Universal, or Mutual. Also in early 1915, the Chicago Sunday Herald followed the Tribune’s lead with not one but three columns partly devoted to movie stars. Gene Morgan wrote the first based on an interview with Chaplin, followed by others at Selig’s Chicago studio. 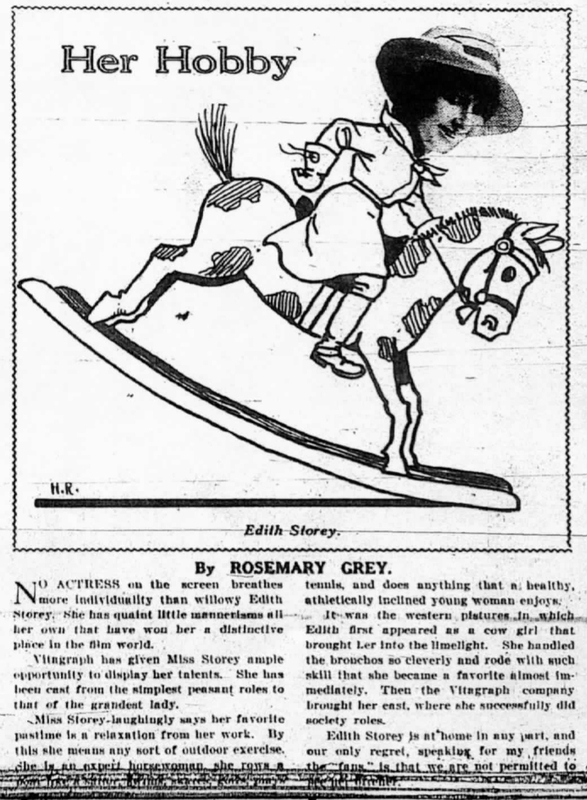 Rosemary Grey composed brief star profiles called “His Hobby” or “Her Hobby,” accompanied by a silly graphic that literalized the title. 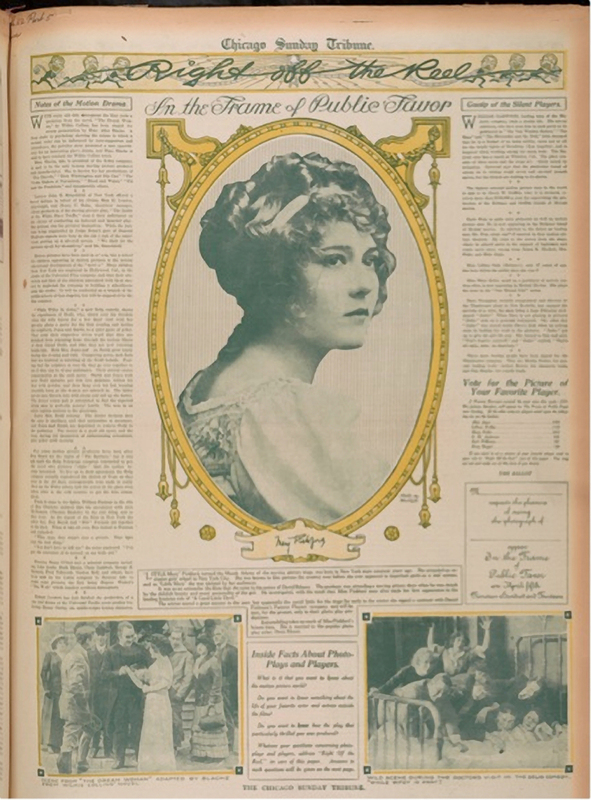 [figure 11] In April, Caroline Carr began writing a weekly star profile – with a prominently centred close up, like that of the Tribune – and headlined by catchy phrases reminiscent of Price: “Ruth Roland Breezily Mixes Tea and Business.”  In March, Louella Parsons, a scriptwriter for Essanay, introduced a daily film review column, “Seen on the Screen” – more on it later – that included a section on “Answers to Questions,” most of which were about stars. She too conducted a few interviews. Prodded by readers, she asked Kathlyn Williams and Francis X. Bushman exactly how many fan letters they received – 500 to 1,500 a week, they revealed. [figure 12] Like Otto, she seemed concerned for the young girls hoping to make it in the movies: one already acting as an extra she warned not to “complain because someone in the studio spoke sharply to you” for “thousands of pretty girls” are ready to replace you. Instead, Parsons’ advice was to praise one fan for her “splendid idea [of] saving all the pictures from the Herald rotogravure section for a scrapbook”  – as Edna Vercoe and her high school girlfriends in Highland Park (north of Chicago) already were doing. In June 1915, Parsons began giving readers even more information about industry figures, especially stars. She conducted frequent interviews in Chicago: with Geraldine Farrar, nibbling roses for breakfast, as she stopped on her way to California; and with Lois Weber who was filming Olga Pavlova in the Sans Souci amusement park. [figure 13] Parsons’ crucial coup was to publish a weekly series in which major stars told “The Story of My Life,” assisted by either a press agent or Parsons herself. The series included Kathlyn Williams, Lilian Gish, and Clara Kimball Young – each story graced by a large studio photo. The most important, undoubtedly, was “The Story of My Life by Charley Chaplin,” whose six instalments ran from July into August, making Chaplin the city’s most publicized movie star. [figure 14] After a one-month hiatus, Parsons resumed her stories, but now, as “the intimate friend of practically all the great stars,” she turned them into successful models for a new series, “How To Become a Movie Actress.”  Tellingly, all but one story featured young women, and Parsons no longer seemed intent on disabusing aspiring fans of their dreams. 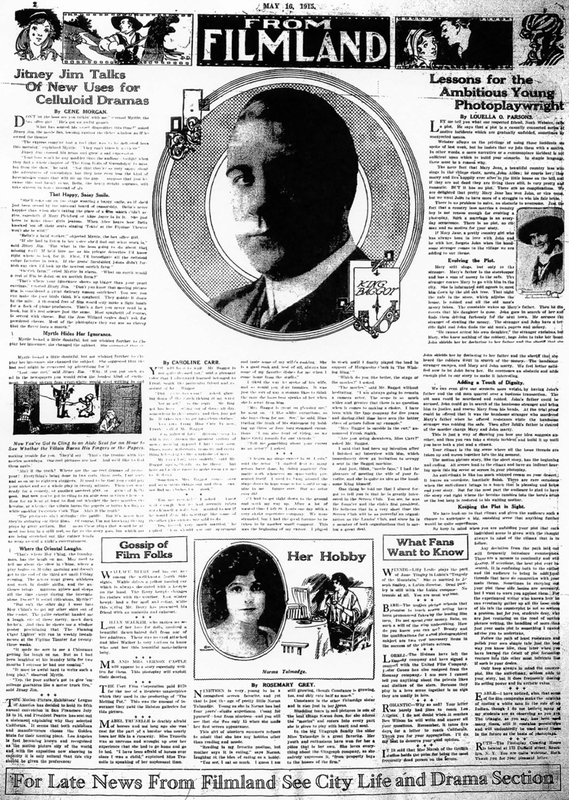 Throughout 1915, “Right Off the Reel” held to a relatively standardised format: a prominent “close up” movie star profile framed by familiar columns on three sides, a bottom corner comic strip, and an appeal to fans to vote for their “favourite player.” In April, Mae Tinee promoted motion pictures with two full-page stories targeting middle class adults: in one, a waiter advises a luncheon club of businessmen where to find the best information on picture theatres; in the other, a businessman’s wife gets similar advice from her neighbour women about how to treat a visiting school friend. 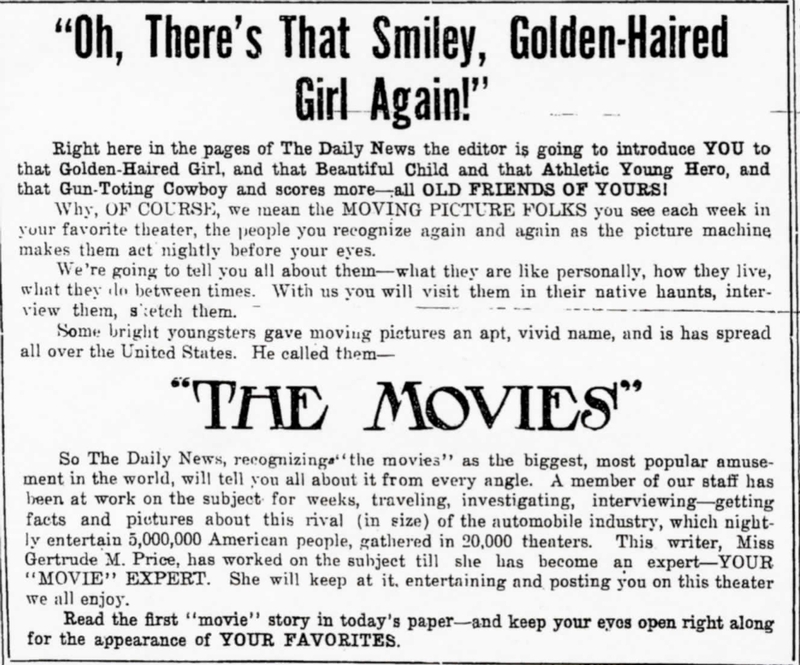 [figure 19] The Tribune recognized her as a valuable asset when ads for its Sunday edition listed “Right Off the Reel” as a top weekly feature. Perhaps because all or some of “Right Off the Reel” circulated through the Tribune’s syndicated service to newspapers in Buffalo, Augusta (Georgia), Fort Worth, and Oakland,  Mae Tinee very likely was the first well known, influential “movie menu” editor/writer in the country. One month after the Tribune, the Chicago Record-Herald introduced its own Sunday page called “Reel Drama.”  Initially it combined industry stories with others of local interest, but gave slightly less attention to stars. In late May, the page adopted a new banner “In the Picture Playhouses” and, after an article in imitation of Mae Tinee’s experience as an “Extra Girl,”  took a more exclusive interest in industry news and gossip.”  Although “In the Picture Playhouses” shrank to half a page on summer Sundays,  just before Labor Day the full page returned, showing more interest in local matters, for example, several “Extra Girl” articles. By early 1915, the Herald’s Sunday page – now bannered “From Filmland”  [figure 20] – was competing with the Tribune’s on nearly equal terms, likely the result of three writers: Morgan, Carr, and, most important, Parsons. For decades newspapers had offered readers, usually in Sunday editions, reviews of current books, stage plays, operas, and art exhibitions as high culture. If men tended to write reviews of stage productions, those dealing with print fiction often were seen as “women’s work.”  The primary aim of such reviews aligned with Progressive principles of social and cultural uplift: they “trained” readers, as Charles Johanningsmeier writes, to accept their standards of appreciation and thus learn how best to read and understand artistic texts, works, and performances. What movie fans could not find were reviews of individual films. That is, until the first half of 1914, when several newspapers began featuring movie review columns in tandem with the new Sunday motion picture pages. See, for instance, certain key essays from the Chicago School of Sociology in the 1920s: Robert E. Park, “The Natural History of the Newspaper,” American Journal of Sociology 29 (1923), 273-289; and Ernest W. Burgess, “The Growth of the City,” in R. E. Park, E. W. Burgess, and R. D. MacKenzie, eds., The City (Chicago: University of Chicago Press, 1925), 47-62. For excellent examples of how this concept of daily newspapers’ function can be applied to early cinema, see Paul S. Moore, “Everybody’s Going: City Newspapers and the Early Mass Market for Movies,” City & Community 4.4 (December 2005): 339-357; and Moore, Now Playing: Early Moviegoing and the Regulation of Fun (Albany: SUNY Press, 2008), 158-163. John Nerone and Kevin G. Barnhurst, “News form and the media environment: a network of represented relationships,” Media, Culture & Society 25 (2003): 112, 121. See also Benedict Anderson, Imagined Communities: Reflections on the Origin and Spread of Nationalism, 2nd ed. (London: Verso, 1991). At the time, John Baker Opdycke made this extravagant claim: the newspaper “is a school in and of itself. It instructs, not only the young, but the adult as well.” See Opdycke, News, Ads, and Sales: The Use of English for Commercial Purposes (New York: Macmillan, 1914), 3. Richard L. Kaplan, Politics and the American Press: The Rise of Objectivity, 1865-1920 (Cambridge: Cambridge University Press, 2002), 125. 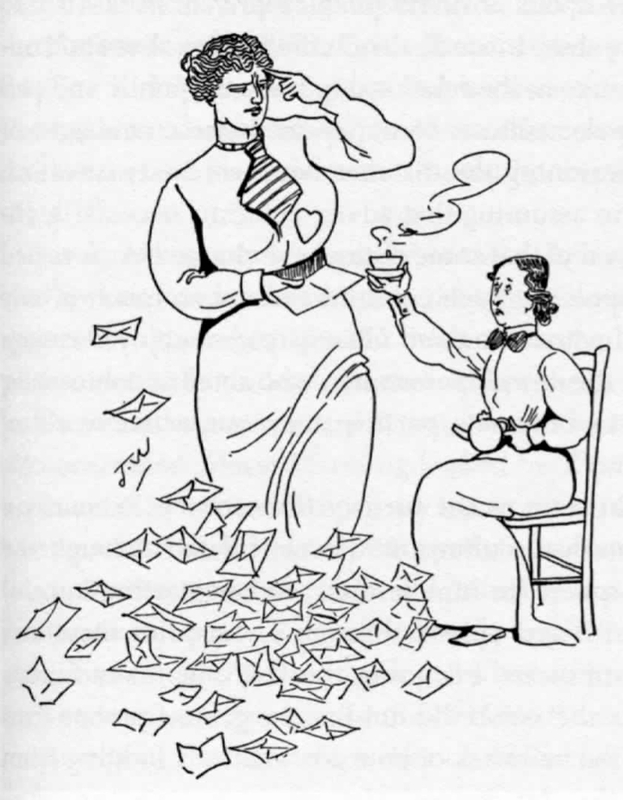 Targeting women, of course, went along with the rise in importance of consumption as a frequent, repeatable social activity, supported by advertising “for which women were conventionally more responsible than men”: Michael Schudson, Discovering the News: A Social History of the Newspaper (New York: Basic Books, 1973), 100. Quoted in Marion T. Marzolf, Up from the Footnote: A History of Women Journalists (New York: Hastings House, 1977), 29. Ishbel Ross, Ladies of the Press (New York: Harper & Brothers, 1936), 60-67; Marzolf, Up from the Footnote, 33-34; George H. Douglas, The Golden Age of the Newspaper (Westport: Greenwood Press, 1999), 182-183. Ross, Ladies of the Press, 74-83; Marzolf, Up from the Footnote, 36-37. See also A.C. Hasselbarth, “Women Writers of American Press,” The Editor and Publisher and Journalist (4 October 1913): 304. Ross, Ladies of the Press, 408-409; and “Woman Press Agent,” The Editor and Publisher (6 May 1911): 15. Marzolf, Up from the Footnote, 32. Alice Fahs, Out on Assignment: Newspaper Women and the Making of Modern Public Space (Chapel Hill, 2011), 1. Jan Olsson, Los Angeles Before Hollywood: Journalism and American Film Culture, 1905-1915 (Stockholm: National Library of Sweden, 2008), 69-98. Olsson’s “five stages of media interaction” in relation to motion pictures are reporter, Flâneur, social reformer, surveyer, and promoter and critic. 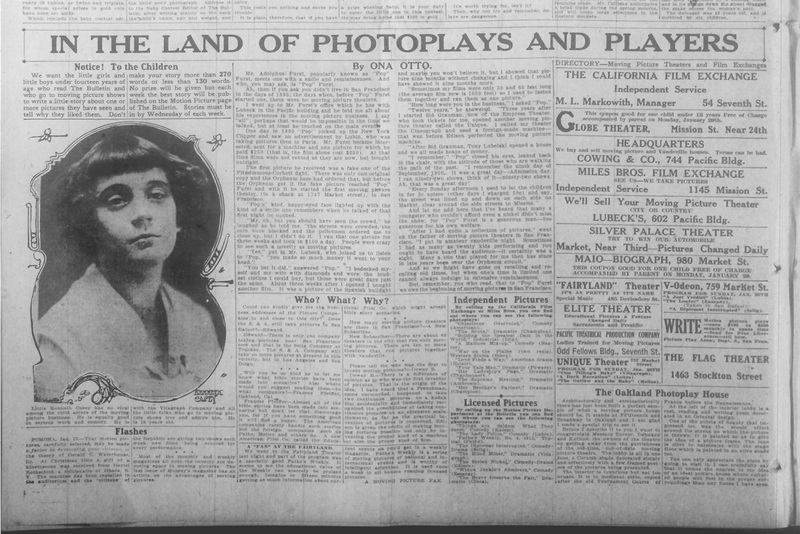 Ona Otto, “In the Land of Photoplays and Players,” San Francisco Bulletin (23 December 1911): 4. Otto is identified as a young woman in “Ona Otto Talks of Photographs and Motor Cars,” San Francisco Bulletin (18 May 1912): 1. See also Epes Winthrop Sargent, “Advice to Exhibitors,” Moving Picture World (20 January 1912): 198. 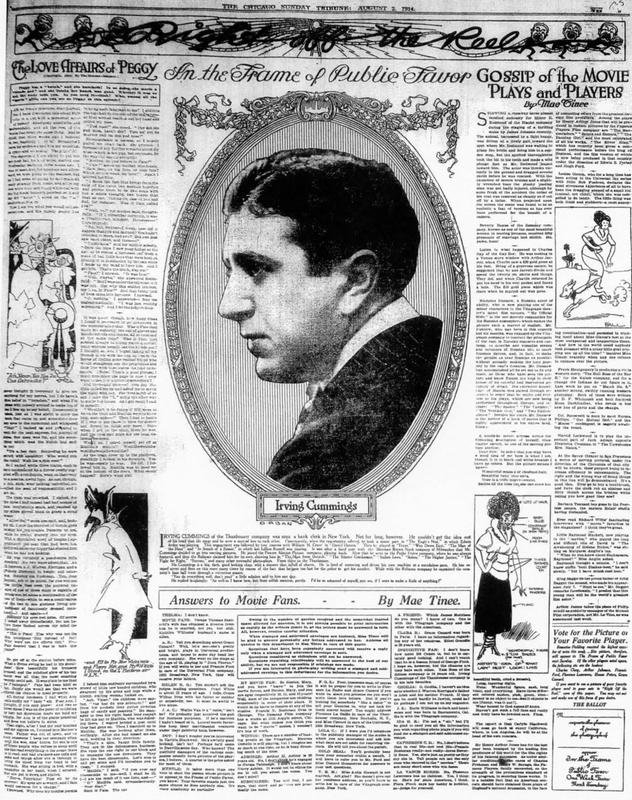 Otto, “In the Land of Photoplays and Players,” San Francisco Bulletin (30 December 1911): 7, (6 January 1912): 7, (13 January 1912): 8, (20 January 1912): 18, and (27 January 1912): 12. The February and March issues of the San Francisco Bulletin were missing from the microfilm reel I consulted. Ona Otto, “Window Shopping,” San Francisco Bulletin (30 January 1912): 8. 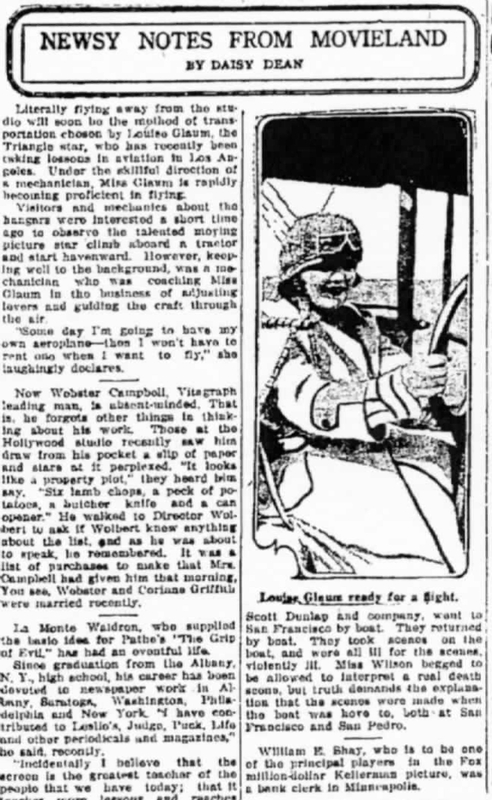 Most of Otto’s other pieces appeared in the Bulletin’s “Automobile and Real Estate Section”: “Land on Way to Fresno From Kerman, a Wonder Picture, Says Miss Otto,” (6 April 1912): 25; Ona Otto, “Motion Slides Take Land to Buyers,” (11 April 1912): 7; “Miss Otto Talks Interestingly of Young Land Agent,” (13 April 1912): 18; “Buying in Kerman Is Road to Wealth,” (13 April 1912): 9; “Selling Real Estate Is Much Like Being a Doctor, Agent Tells Miss Otto,” (20 April 1912): 20; Ona Otto, “Beautiful Garden of Roses at Burlingame Soon to Be Subdivided,” (27 April 1912): 15; “Ona Otto Sees Great Picture in Havenscourt,” (4 May 1912): 16; “Ona Otto Urges Young Men to Take Up Farming,” (11 May 1912): 16; and “Ona Otto Talks of Photographs and Motor Cars,” (18 May 1912): n.p. “Here You Are Folks! All About ‘The Movies’,” Chicago Day Book (11 November 1912): 11; and “The Movies,” Des Moines News (11 November 1912): 2, and Cleveland Press (11 November 1912): 1. Richard Abel, Americanizing the Movies and “Movie-Mad” Audiences, 1910-1914 (Berkeley: University of California Press, 2006), 223-224, 241-247. Gerald Baldasty, E. W. Scripps and the Business of Newspapers (Urbana: University of Illinois Press, 1999), 143. In the Frame of Public Favor,” Chicago Sunday Tribune (1 March 1914): 5.3. “In the Frame of Public Favor,” Chicago Sunday Tribune (8 March 1914): 5.3, (22 March 1914): 5.3, (29 March 1914): 5.3, (5 April 1914): 5.3, (16 April 1914): 5.3, (10 May 1914): 5.3, and (21 June 1914): 8.3. “Gossip of the Silent Players,” Chicago Sunday Tribune (1 March 1914): 5.3. “Answers to Questions,” Chicago Sunday Tribune (15 March 1914): 5.3; “Answers to Movie Fans by Mae Tinee,” Chicago Sunday Tribune (12 April 1914): 5.3, and (19 April 1914): 5.3. “In Movieland,” Chicago Sunday Tribune (4 October 1914): 8.4, and (15 November 1914): 8.7. “Mae Tinee, “Latest News from Movie Land,” Chicago Sunday Tribune (7 February 1915): 8.5. See the full-page advertisement in the Chicago Tribune (27 February 1915): 7. Gene Morgan, “What Tyrone Power Thinks of Himself and the Celluloid Drama,” Chicago Sunday Herald (17 January 1915): 6.6; Morgan, “Auburn Haired Personality in Film,” Chicago Sunday Herald (31 January 1915): 6.7; Morgan, “In Reel Life But Not in Real Life,” Chicago Sunday Herald (7 March 1915): 6.6. Rosemary Gray, “His Hobby [Francis X. Bushman],” Chicago Sunday Herald (24 January 1915): 6.6; and Gray, “Her Hobby [Kathlyn Williams].” Chicago Sunday Herald (31 January 1915): 6.6. Later this column would adopt more conventional graphics. Caroline Carr, “Ruth Roland Breezily Mixes Tea and Business,” Chicago Sunday Herald (18 April 1915): 5.6; Carr, “Pretty Grace Darmond, Who Rides, Swims, Acts,” Chicago Sunday Herald (25 April 1915): 5.6; and Carr, “Essanay Star Says Movies Will Only Take Professionals,” Chicago Sunday Herald (2 May 19150: 5.6. Luella [sic] O Parsons, “Seen on the Screen,” Chicago Herald (20 March 1915): 14. Louella O Parsons, “Seen on the Screen,” Chicago Herald (1 April 1915): 12, and (10 May 1915): 8. Local industry leaders such as Aaron Jones, Alfred Hamburger, George K. Spoor, and Winfield R. Sheenan (Fox Film) more frequently were her interview subjects: see Louella O Parsons, “Seen on the Screen,” Chicago Herald (9 April 1915): 8, (12 May 1915): 10, (2 June 1915): 8, and (4 June 1915): 10. Louella O Parsons, “Seen on the Screen,” Chicago Herald (7 May 1915): 8. Louella O Parsons, “Seen on the Screen,” Chicago Herald (12 April 1915): 8, and (20 May 1915): 8; and Louella O Parsons, “Girls All Eager for Chance To Become ‘Movie’ Actresses,” Chicago Herald (24 May 1915): 8. Louella O Parsons, “ Seen on the Screen,” Chicago Herald (19 April 1915): 8. “The Story of My Life by Kathlyn Williams,” Chicago Sunday Herald (13 June 1915): 5.2; “The Story of My Life by Edna Mayo, Chicago Sunday Herald (20 June 1915): 5.6; “The Story of My Life by Marguerite Clark,” Chicago Sunday Herald (27 June 1915): 5.6; Louella O. Parsons, “The Story of Lillian Gish – ‘Most Beautiful Blonde in the World’,” Chicago Sunday Herald (11 July 1915): 6.5; and Louella O. Parsons, “Here’s Ideal Film Personality – Clara Kimball Young Is Playful Child and Brainy Woman,” Chicago Sunday Herald (18 July 1915): 6.6. “The Story of My Life By Charley Chaplin,” Chicago Sunday Herald (4 July 1915): 5.6, and (8 August 1915): 5.6. See also Charlie Chaplin’s Own Story (Indianapolis: Bobbs-Merrill, 1916). Louella O. Parsons, “How to Become a Movie Actress,” Chicago Sunday Herald (19 September 1915): 6.1, and (26 September 1915): 5.6; Louella O. Parsons, “How to Become a Movie Star,” Chicago Sunday Herald (3 October 1915): 6.3, (10 October 1915): 6.6, (17 October 1915): 6.4, (24 October 1915): 6.3, and (31 October 1915): 6.3. Daisy Dean, “News Notes from Movieland,” Canton Repository (6 January 1916): 12; and “Listen! Movie Fans,” La Crosse Tribune (10 January 1916): 1. See, for instance, “Amusements,” San Antonio Light (31 July 1915): 8. Where Daisy Dean was located remains uncertain, although someone with that name is mentioned, about that same time, as having “left this morning for a trip to the Pacific Coast” from a town near Janesville, Wisconsin: see “Avalon,” Janesville Gazette (5 August 1915): 8. “News Notes from the Movies,” La Crosse Tribune (11 January 1916): 3. Daisy Dean, “News Notes from Movieland,” Canton Repository (1 April 1916): 10. Daisy Dean, “News Notes from Movieland,” Canton Repository (10 April 1916): 11. Daisy Dean, “Newsy Notes from Movieland,” Hutchinson News (14 February 1916): 12. Daisy Dean, “Newsy Notes from Movieland,” Hutchinson News (9 February 1916): 12, (8 June 1916): 8, (16 August 1916): 10, and (9 October 1916): 4. Daisy Dean, “Newsy Notes from Movieland,” Hutchinson News (26 May 1916): 14, (8 July 1916): 11, and (13 October 1916): 4. For a sustained analysis of these and other women working at Universal during this period, see Mark Garrett Cooper, Universal Women: Filmmaking and Institutional Change in Hollywood (Urbana: University of Illinois Press, 2010). Daisy Dean, “Newsy Notes from Movieland,” Hutchinson News (22 November 1916): 4. “Right Off the Reel” may have first appeared as the title of a weekly column in Exhibitors’ Times, beginning on 24 May 1913. The writer was T.B. or Thomas Bedding, one of the trade journal’s editors. “Answers to Movie Fans,” Chicago Sunday Tribune (12 April 1914): 5.3. Mae Tinee, “Babes in the Movie Zoo,” Chicago Sunday Tribune (12 April 1914): 5.3; and “Mae Tinee Writes from New York,” Chicago Sunday Tribune (19 April 1914): 5.3. 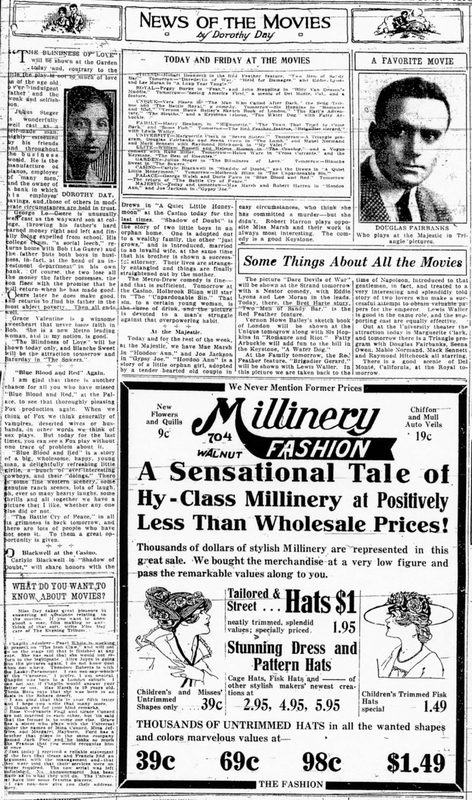 “Answers to Movie Fans by Mae Tinee,” Chicago Sunday Tribune (31 May 1914): 5.3; “Gossip of the Movie Plays and Players,” Chicago Sunday Tribune (12 July 1914): 8.5; and Mae Tinee, “Gossip of the Movie Plays and Players,” Chicago Sunday Tribune (2 August 1914): 8.5. “The Voice of the Movie Fans,” Chicago Sunday Tribune (20 September 1914): 8.4, (27 September 1914): 8.5, and (4 October 1914): 8.4. “In Movieland,” Chicago Sunday Tribune (27 September 1914): 8.5, (22 November 1914): 8.11, (29 November 1914): 8.4, and (9 December 1914): 8.9. “Right Off the Reel by Mae Tinee,” Chicago Sunday Tribune (31 January 1915): 5.3. “The Frame of Public Favor,” Chicago Sunday Tribune (3 January 1915): 8.7. Whether or not one should trust this profile of Francis Peck (aka Mae Tinee) is uncertain, but an early biographical note claims she was the daughter of a Denver evangelist, served as a cub reporter on the Denver Republican, and, after a failed marriage, moved to Chicago to join the Chicago Tribune: see Ishbel Ross, Ladies of the Press, 411-412. 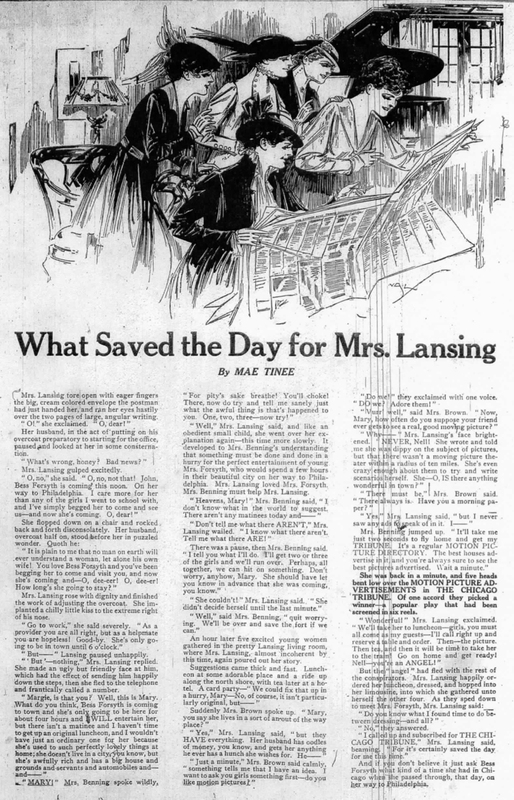 Mae Tinee, “The Waiter’s Tip or A Discovery,” Chicago Tribune (17 April 1915): 8; and Mae Tinee, “What Saved the Day for Mrs. Lansing,” Chicago Tribune (1 May 1915):12. 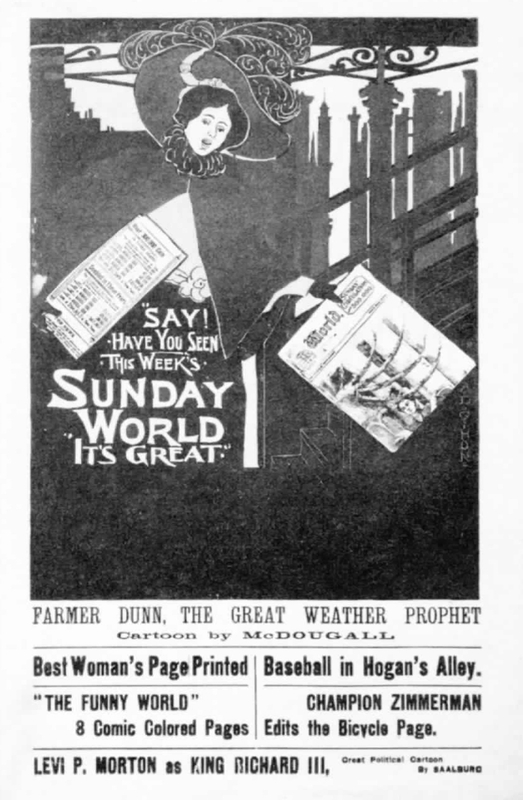 “Tomorrow’s Sunday Tribune” ad, Chicago Tribune (22 May 1915): 14, and (17 July 1915): 5. See “Right Off the Reel,” Augusta Chronicle, from (8 March 1914): C.8, to (3 January 1915): C.8; “Right Off the Reel,” Buffalo Courier, from (15 March 1914): 55, to (3 January 1915): 52; and “Right Off the Reel,” Oakland Tribune (29 March 1914): 12, and (14 June 1914): 12. By September 1914, the Augusta Chronicle was reprinting only “In the Frame of Public Favor” and “The Love Affairs of Peggy” and filling the rest of the page with three or four large picture theatre ads: Augusta Chronicle (20 September 1914): C.8. See the previous note for the Fort Worth Star-Telegram’s claim to participate, with the Tribune, in the scenario contest that led to The Diamond From the Sky. “Reel Drama,” Chicago Sunday Record-Herald (29 March 1914): 2.5. The circulation of the Sunday Record-Herald nearly equaled that of the Sunday Tribune. 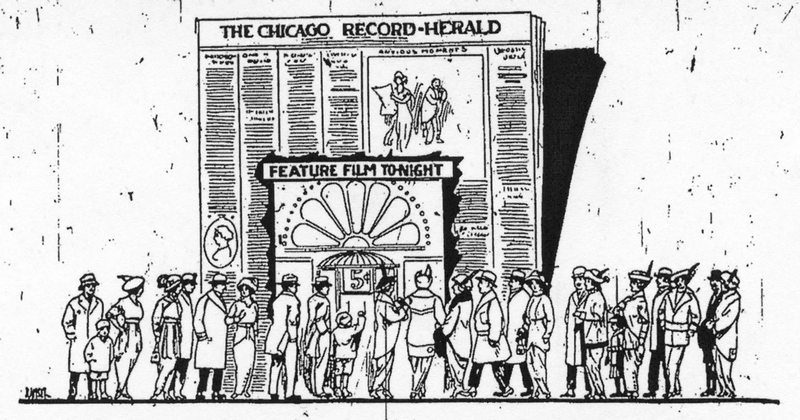 Ray H. Leek, “Reducing ‘The Spoilers’ to Film” and “La Salle to Become Film Theater,” Chicago Sunday Record-Herald (29 March 1914): 2.5; “‘Dope’ Fiends in the Making” and “The Studebaker Now Film House,” Chicago Sunday Record-Herald (5 (April 1914): 2.5; and “Gossip of the Photoplay Theaters and Occupants,” Chicago Sunday Record-Herald (19 April 1914): 2.5. An “Extra Girl,” “How the ‘Extra Girl’ Breaks Into Movie Acting—for a While,” Chicago Sunday Record-Herald (24 May 1914): 2.5. “Art, Religion, and Other Causes Aided by ‘Movies’,” Chicago Sunday Record-Herald (31 May 1914): 2.5; and “You Just Can’t Kill a Movie Actor; Richard Travers Has Proved This,” Chicago Sunday Record-Herald (7 June 1914): 2.4. “In the Picture Playhouses,” Chicago Herald (11 August 1914): 11. The Chicago Record-Herald became simply the Chicago Herald in mid-June 1914 -“History of the Four Papers That Are Now The Herald,” Chicago Sunday Herald (14 June 1914): 1.6. 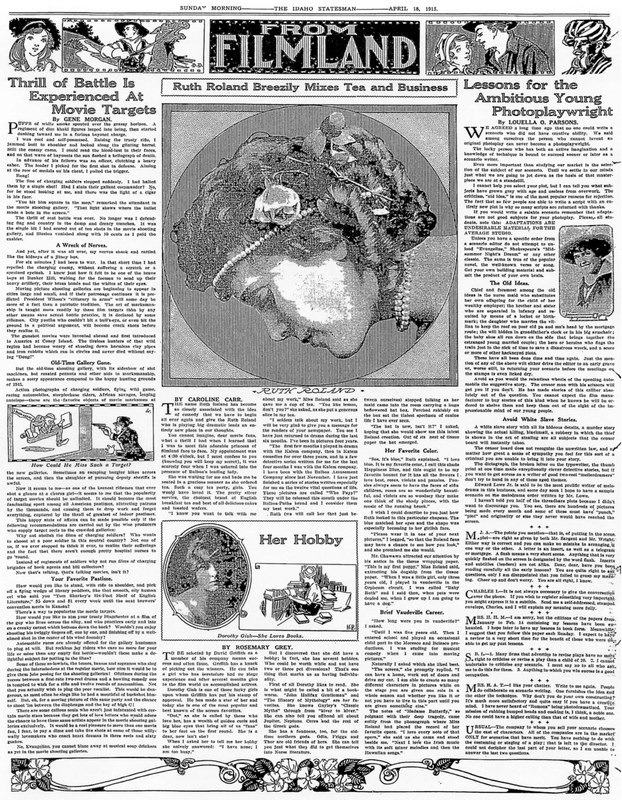 The “Extra Girl,” “How Beery Came to Be a Lady,” Chicago Sunday Herald (13 September 1914): 2.4; “On the Outside Watching an Ade Photoplay,” Chicago Sunday Herald (20 September 1914): 2.4; and The “Extra Girl,” “Novelli Loves Conflict of Either Weapons or Hearts,” Chicago Sunday Herald (22 November 1914): 6.6. “Come to Our Movies,” Chicago Sunday Herald (17 January 1915): 6.6; “In the Picture Playhouses,” Chicago Sunday Herald (24 January 1915): 6.6, and (31 January 1915): 6.7; and “From Filmland,” Chicago Sunday Herald (7 February 1915): 6.6. See the full-page ad for Parsons’s column, Chicago Sunday Herald (13 December 1913): Magazine 8; Louella O. Parsons, “How to Write Photo Plays,” Chicago Sunday Herald (13 December 1914): 6.8, (20 December 1914): 6.6, (27 December 1914): 6.8, and (3 January 1915): 6.6. For further information on Parsons see Samatha Barbas, The First Lady of Hollywood: A Biography of Louella Parsons (Berkeley: University of California Press, 2005). Louella O. Parsons, How to Write for the Movies (Chicago: McClurg, 1915). Louella O. Parsons, “The Story of Lillian Gish – “Most Beautiful Blonde in the World,” Chicago Sunday Herald (11 July 1915): 6.5; and Parsons, “”Here’s Ideal Film Personality – Clara Kimball Young Is Playful Child and Brainy Woman,” Chicago Sunday Herald (18 July 1915): 6.6. See the large ad, Chicago Herald (16 September 1915); 7; and Louella O. Parsons, “How To Become A Movie Actress,” Chicago Sunday Herald (19 September 1915): 6.1. Louella O. Parsons, “How To Become A Movie Star,” Chicago Sunday Herald (3 October 1915): 6.3, (10 October 1915): 6.6, (17 October 1915): 6.4, (7 November 1915): 5.1, (14 November 1915): 5.6, (21 November 1915): 5.4, and (28 November 1915): 5.4. Sunday Herald ad, Chicago Herald (18 February 1915): 12. 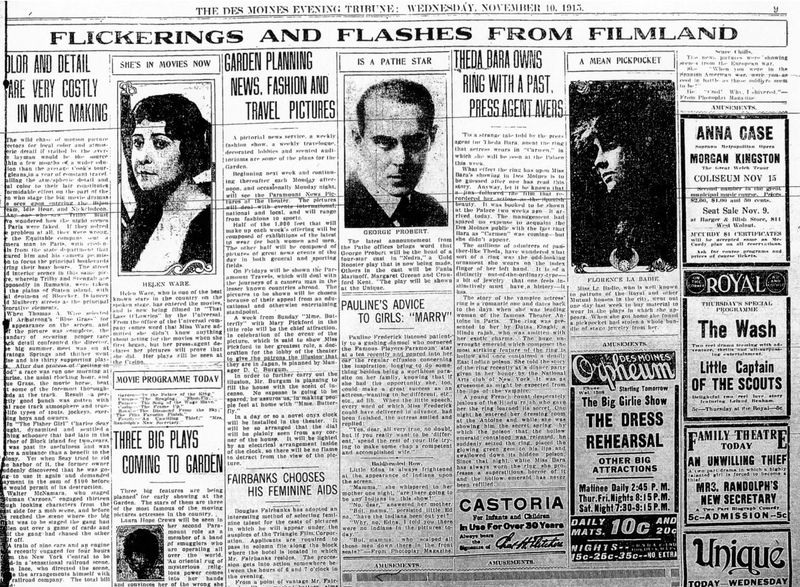 See, for instance, the “From Filmland” Sunday page in the Boise Idaho Statesman (18 April 1915): n.p., and Oakland Tribune (25 April 1915): 31, and (17 October 1915): 13. Gottlieb seems to have been a friend of the A.H. Blank family; a year before her first column appeared, she and Mrs. Blank won top prizes in a card game involving forty players: see “This Page of Special Interest to Women,” Des Moines Capital (14 September 1914): 8. She went on to head the public relations department of A.H. Blank’s circuit of cinemas in the 1920s and for Central States Theater Corporation from 1933 to 1950: see Variety Obituaries, vol. 6, 1964-1968 (New York: Garland, 1988), n.p..
 “News of the Movies,” Des Moines Evening Tribune (17 August 1915): 3, (2 September 1915): 6, and (29 September 1915); 14. “Flickerings and Flashes from Filmland,” Des Moines Evening Tribune (10 November 1915): 9. 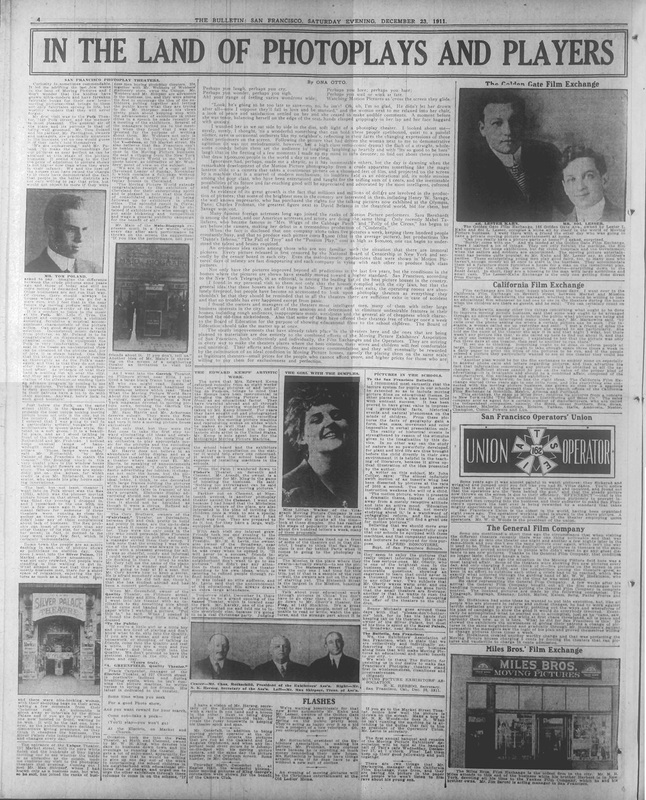 See the similar, unbannered page, Des Moines Evening Tribune (3 November 1915): 10. 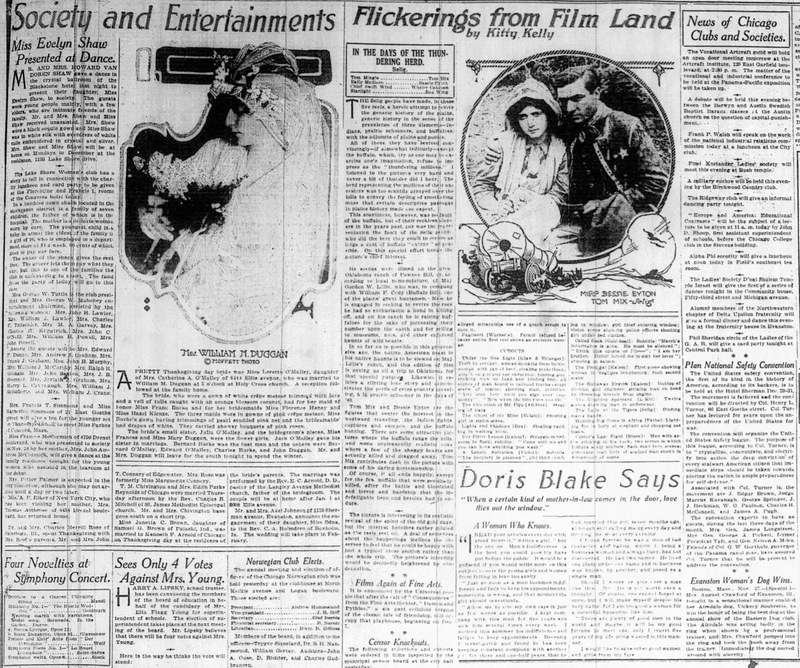 One month later, the Des Moines Register and Leader introduced a similar Sunday page and then briefly adopted the same banner: see “The Week at the Moving Picture Houses,” Des Moines Register and Leader (26 December 1915): 5; and “Flickerings and Flashes from Filmland,” Des Moines Register and Leader (23 January 1916): 7. See the Y.M.C.A. 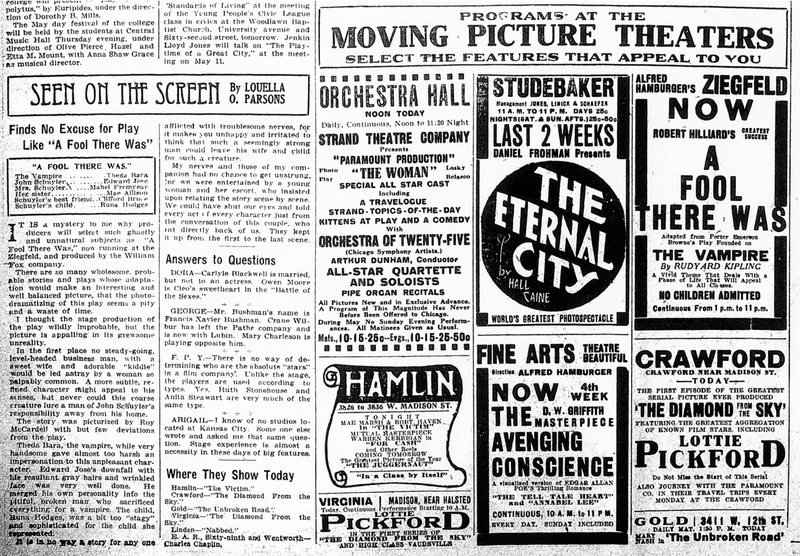 ad, Des Moines Evening Tribune (17 November 1915): 9; and “Film Club Formed by Movie Patrons,” Des Moines Evening Tribune (22 December 1915): 11. “News of the Movies,” Des Moines Evening Tribune (17 January 1916): 5, and (16 February 1916): 10. “New of the Movies,” Des Moines Evening Tribune (24 January 1916): 4, and (25 January 1916): 3. 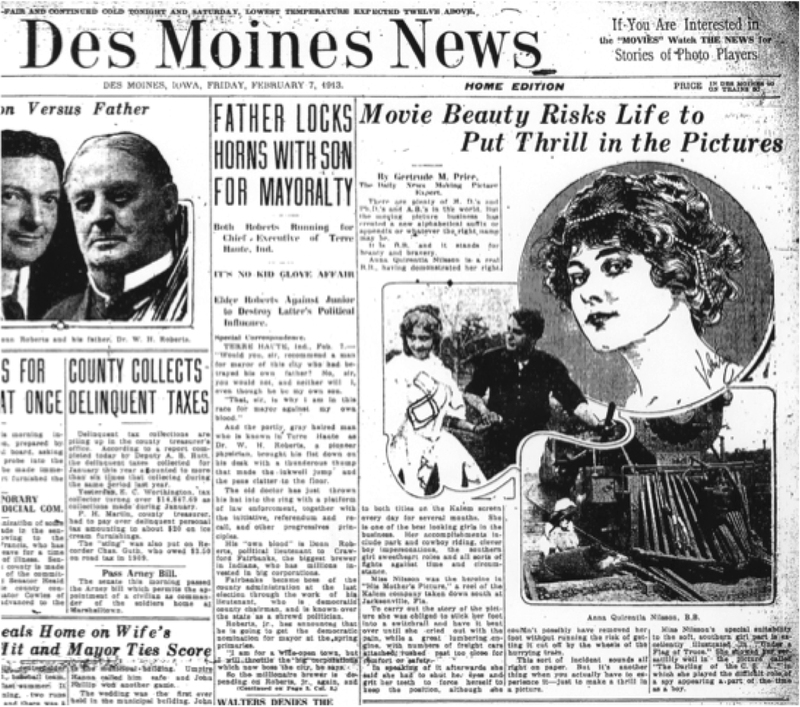 “News of the Movies,” Des Moines Evening Tribune (2 February 1916): 4, and (3 February 1916): 16. “What Do You Want to Know About Movies? By Dorothy Day” Des Moines Evening Tribune (25 February 1916): 3; “Arbuckle Weighed 16 Pounds at Birth; Grown Some Since by Dorothy Day,” Des Moines Evening Tribune (26 February 1916): 5; “Men and Women Take Lives in Their Own Hands by Dorothy Day,” Des Moines Evening Tribune (29 February 1916): 9; and “Today and Thursday at the Movies by Dorothy Day,” Des Moines Evening Tribune (1 March 1916): 9. Fahs, Out on Assignment, 32. See, for instance, “Today’s Best Moving Picture Story,” Chicago Tribune (5 February 1914): 5. Kitty Kelly, “Today’s Best Photoplay Stories,” Chicago Tribune (1 July 1914), 13; and Audrie Alspaugh, “Mr. 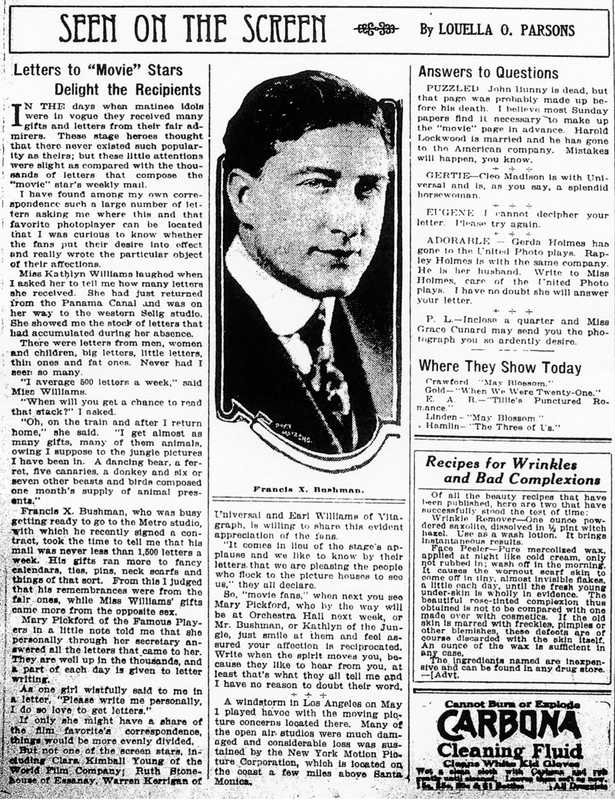 Wells on the Novel of the Future,” Chicago Tribune (1 August 1914): 11. See also Ishbel Ross, Ladies of the Press: The Story of Women in Journalism by an Insider (New York: Harper & Brothers, 1936), 427-428. Kitty Kelly, “Photoplay Stories and News,” Chicago Tribune (8 July 1914), 11. 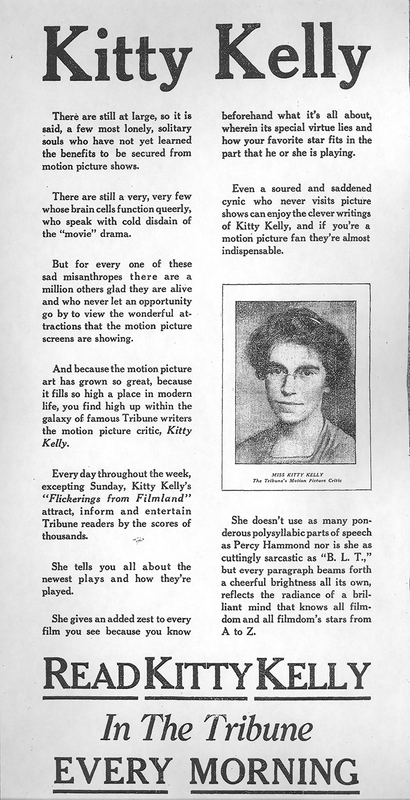 Kitty Kelly, “In Celluloid Land with Kitty Kelly,” Chicago Tribune (19 September 1914), 11; Kitty Kelly, “Flickerings from Film Land by Kitty Kelly,” Chicago Tribune (26 September 1914), 9. 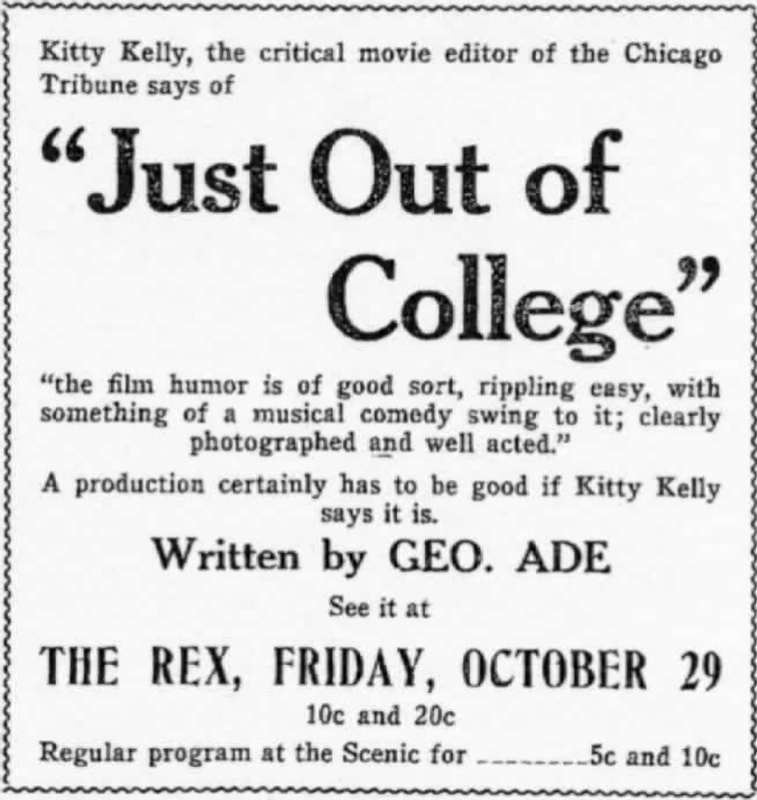 The column’s title actually continued to fluctuate for the next month and finally did settle on “Flickerings from Film Land by Kitty Kelly” on October 28, 1914. Advertisement, Chicago Sunday Tribune (3 January 1915): 8.3. Most prominent, of course, were cartoonists, drama and music writers, sports writers, and humorists. “Today’s Best Photo Play Stories,” Chicago Tribune (1 April 1914): 13. “Today’s Best Photo Play Stories,” Chicago Tribune (13 June 1914): 13, and (20 June 1914): 9. Kitty Kelly, “Photoplay Stories and News,” Chicago Tribune (22 July 1914): 11. Kitty Kelly, “Flickerings from Film Land,” Chicago Tribune (4 March 1915): 8. Kitty Kelly, “Flickerings from Film Land,” Chicago Tribune (6 January 1915): 10. Kitty Kelly, “Flickerings from Film Land,” Chicago Tribune (3 May 1915): 18. 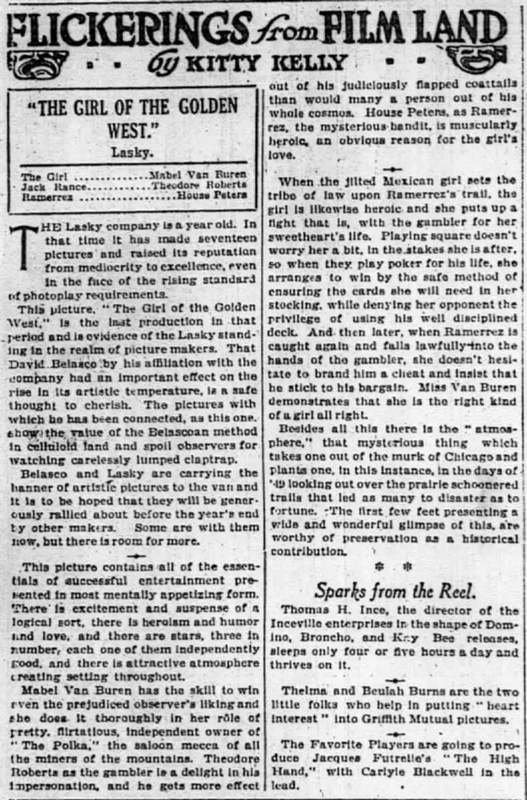 See also her review of Famous Players’ The Dictator in which she summed up the “proper criteria of excellence” as theme, beauty, photography, and acting: Kitty Kelly, “Flickerings from Film Land,” Chicago Tribune (22 June 1915): 18. Kitty Kelly, “Flickerings from Film Land,” Chicago Tribune (2 February 1915): 10. Kitty Kelly, “Flickerings from Film Land,” Chicago Tribune (19 January 1915): 10. Kitty Kelly, “Flickerings from Film Land,” Chicago Tribune (24 February 1915): 12. Kitty Kelly, “Flickerings from Film Land,” Chicago Tribune (6 July 1915): 18. Two year later, in France, Louis Delluc would greatly expand on Kelly’s astute observation: Louis Delluc, “La Beauté au cinema,” Le Film 73 (6 August 1917): 4-5, translated in Richard Abel, ed., French Film Theory and Criticism: A History/Anthology, 1907-1929 (Princeton: Princeton University Press, 1988), 137-139. Kitty Kelly, “Flickerings from Film Land,” Chicago Tribune (21 July 1915): 12. Louella O. Parsons, “Seen on the Screen,” Chicago Herald (19 March 1915): 13. Luella [sic] O. Parsons, “Seen on the Screen,” Chicago Herald (22 March 1915): n.p. Louella O. Parsons, “Seen on the Screen,” Chicago Herald (27 March 1915): 8, and (3 April 1915): 12. She also devoted one column to visiting the local Selig studio: see Parsons, “Seen on the Screen,” Chicago Herald (2 April 1915): 10. Louella O. Parsons, “Seen on the Screen,” Chicago Herald (24 March 1915): 7. Louella O. Parsons, “Seen on the Screen,” Chicago Herald (22 April 1915): 10, (4 May 1915): 8, and (11 May 1915): 8. 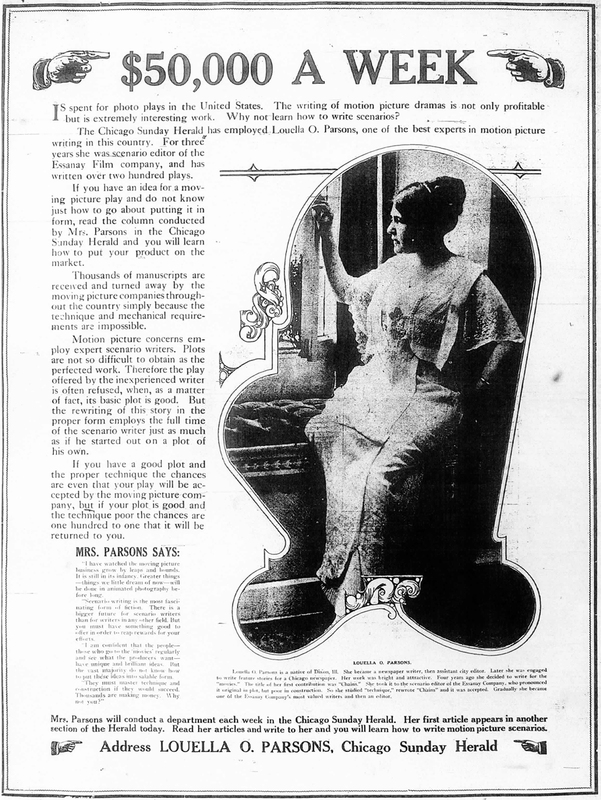 Louella O. Parsons, Seen on the Screen,” Chicago Herald (18 May 1915): 8. Louella O. Parsons, “Seen on the Screen,” Chicago Herald (10 April 1915): 8, and (12 May 1915): 10. “Seen on the Screen by The Film Girl,” Syracuse Herald (17 June 1915): 11. The Motion Picture News took special note of this “young lady of education and refinement who attends the showing of all pictures in the downtown section and gives her unbiased criticism of every program” (for what it called “a conservative paper”) and sometimes traveled to New York “to attend advance showings of the bigger and better pictures.” See “The Press, Press Representative and the Picture—VI,” Motion Picture News (20 November 1915): 46. “Herald ‘Film Girl’ for Overseas Duty,” Syracuse Herald (13 October 1918): 1; and “Sails for France,” Syracuse Herald (11 December 1918): 3. 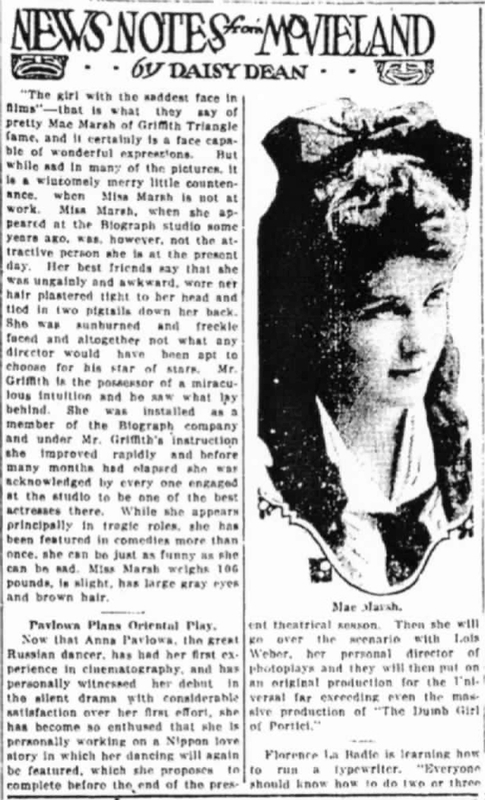 “Seen on the Screen by The Film Girl” and “Daily Talks by Mary Pickford,” Syracuse Herald (10 November 1915): n.p. “Seen on the Screen by The Film Girl,” Syracuse Herald (22 June 1915): 9. See also “Seen on the Screen by The Film Girl,” Syracuse Herald (15 October (1915): n.p. “Seen on the Screen by The Film Girl,” Syracuse Herald (15 July 1915): 11. “Seen on the Screen by The Film Girl,” Syracuse Herald (22 November 1915): 9. “Seen on the Screen by The Film Girl,” Syracuse Herald (8 July 1915): 11. “Seen on the Screen by The Film Girl,” Syracuse Herald (16 October 1915): 7. Tess of Storm Country was shown during “Mary Pickford week at the Strand”—“Seen on the Screen by The Film Girl,” Syracuse Herald (15 November 1915): 13, and (16 November 1915): 11. “Seen on the Screen by The Film Girl,” Syracuse Herald (28 June 1915): 7, (5 October 1915): 11, and (28 December 1915): 5. “Seen on the Screen by The Film Girl,” Syracuse Herald (28 July 1915): 11. “Seen on the Screen by The Film Girl,” Syracuse Herald (14 September 1915): 9. “Seen on the Screen by The Film Girl,” Syracuse Herald (2 November 1915): 11, and (6 November 1915): 9. “Seen on the Screen by The Film Girl,” Syracuse Herald (2 July 1915): 15. 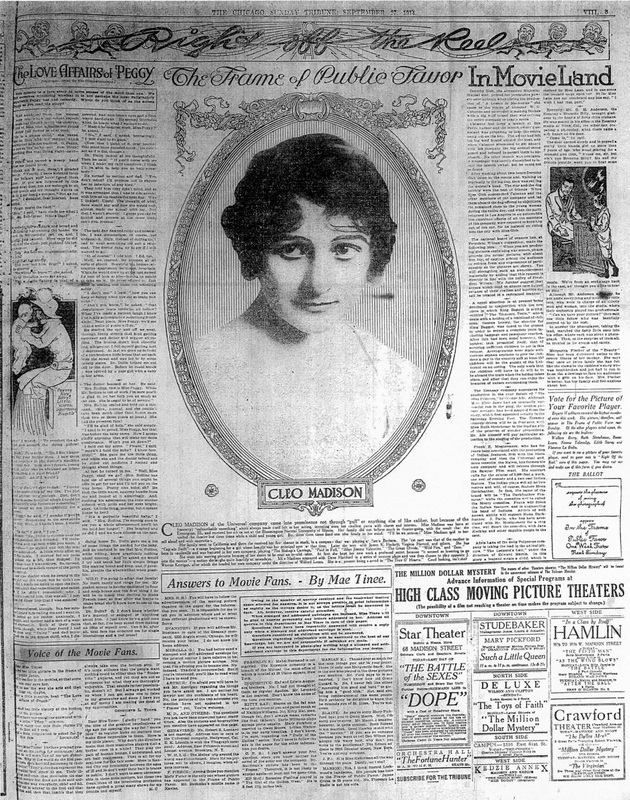 She also called attention to the Motion Picture News’ campaign to promote newspaper advertising – “Seen on the Screen by The Film Girl,” Syracuse Herald (17 September 1915): 11. “Seen on the Screen by The Film Girl,” Syracuse Herald (17 July 1915): 27, and (7 August 1915): 6. “Seen on the Screen by The Film Girl,” Syracuse Herald (29 June 1915): 11. “Seen on the Screen by The Film Girl,” Syracuse Herald (13 August 1915): 33. Ad, Chicago Tribune (30 April 1916). Kitty Kelly, “Flickerings from Film Land,” Chicago Tribune (25 May 1915): 18. Mae Tinee, “Flickerings from Film Land,” Chicago Tribune (10 April 1915): 11. Thanks to Victoria Duckett for suggesting that this described, shared engagement with a film may be read as a modern form of ekphrasis. For an astute analysis of a similar viewing experience in 18th century painting, see Michael Fried, Absorption and Theatricality: Painting and the Beholder in the Age of Diderot (Berkeley: University of California Press, 1980). Harriette Underhill, among many other women writing about motion pictures in the 1910s (but rarely in newspapers), is included in Antonia Lant and Ingrid Periz, eds., Red Velvet Seat: Women’s Writing on the First Fifty Years of Cinema (London: Verso, 2006), 478-481. This information comes from research shared by Kavah Askari on a panel at the SCMS conference in Chicago, 8 March 2013.